Do you ever feel like you’re being “dragged” through your life? Do you ever feel stuck in a situation you can’t get out of or trapped with a person you don’t like? Do you sometimes feel like you’re swimming upstream against the current . . . working hard, doing everything you know to do, but not getting anywhere? Do you ever feel powerless to effect a change in your direction? What are you holding on to? 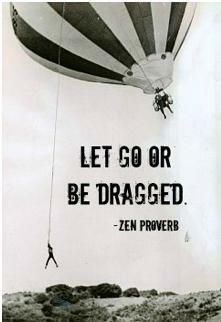 Why are you afraid to let go of the very things that drag you down? Your ego fears keep you feeling stuck and dragged through life. If I let go of putting out all the “fires” around me, everything will go to pieces (fear of failure). If I say “no” to someone’s request, they might not like it/me (fear of rejection). If I don’t spend an inordinate amount of time getting something perfect, someone will find something wrong with it (fear of making a mistake). If I do let go of all the “stuff” I’m holding on to, l have no idea what life will be like (fear of getting worse).The ego’s job is to keep you safe, but unfortunately, it doesn’t know the difference between real fear and imagined fear. The fears listed above are ego fears, not “real” fears. In other words, your ego is at stake, but not your life or limb. By letting go, sure there’s a possibility you’ll fail or be rejected or make a mistake or it might even get worse. But you won’t die. In fact, letting go and moving through your ego fears may be the very thing you have to do to really be free! be the keeper of the Truth? You find yourself always fighting, resisting and wanting things or people to be different. Recognizing that your views are simply your views and letting go of being right may be the very thing you have to do to be free! Societal “shoulds” and “have tos” keep you feeling trapped and dragged through life. How often to you hold on to the belief that you “should” do something or you “have to” do something – and you really don’t want to do it? You feel like society or someone outside of yourself is somehow “making” you do it, because if you don’t you’ll be doing something wrong (there’s the ego fear again). You think you have to pay bills, work, cook, clean, etc., but that’s not true. You don’t have to do anything. There are plenty of people who don’t do any of these things. You do them out of choice because you prefer the results that action generates over the consequences that would occur if you didn’t do it. You pay your bills because you don’t want to late fees or lose your credit. You don’t “have to” pay your bills. You CHOOSE to pay your ills.Therefore, shifting your thinking to: I “get” to do these things vs. I “have” to do these things will set you free. Letting go of the belief that someone is making you do something and realizing the choice to do it or to not do it, is totally yours, may be the very thing you have to do to be free! Thank you to my good friend, Julie Shafer for this great quote.